Enterprise Rent-A-Car Ireland, part of the world’s largest car rental group, is the official car partner of this Sunday’s SSE Airtricity Dublin City Marathon for the fourth consecutive year. Now in its 37th year, the SSE Airtricity Dublin City Marathon is considered to be one of the leading marathons on a global scale and showcases Dublin at its very best to an international audience. 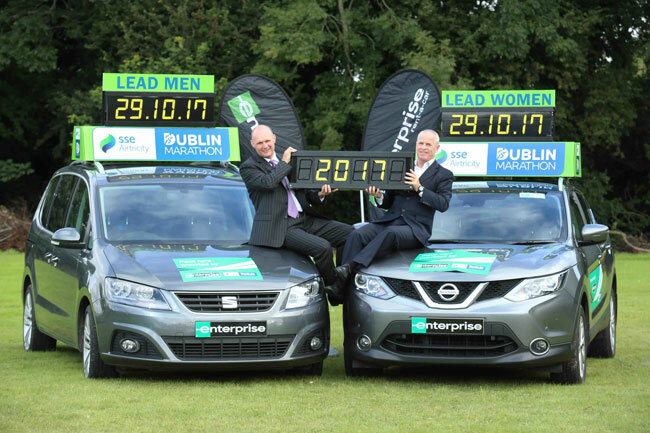 George O’Connor, MD of Enterprise Rent-A-Car Ireland, and Eugene Coppinger, Assistant Race Director, SSE Airtricity Dublin Marathon, at the announcement of the Enterprise partnership for the 2017 Dublin City Marathon. A team of Enterprise Rent-A-Car employees will assist organisers of the event, which takes place on this Sunday (29th October), by providing a total of 36 vehicles for use during the event. These include 12 lead pace cars to guide the runners around the 26-mile course, as well as five safety vehicles to ferry any casualties to the Medical Team facility, five stationary timing vehicles and 14 logistics vans. Aside from the provision of vehicles, the Enterprise team is participating in a voluntary capacity with staff member, David Hudson, entering his 20th year as a member of the Dublin Marathon Committee and set to join the 1,135 stewards that will oversee the day. “We are extremely proud to be involved again with the SSE Airtricity Dublin City Marathon and have enjoyed a very happy partnership with them for the last four years. This year, once again, a number of our staff and business partners are participating in the marathon which gives us an even deeper level of involvement in Ireland’s key marathon event,” stated George O’Connor, managing director, Enterprise Rent-A-Car Ireland. JP Denker, national marketing manager, Enterprise Rent-A-Car, is among those participating from the company. “I am delighted to be able to once again run the SSE Airtricity Dublin City Marathon. It’s a brilliant event that is hugely beneficial to Dublin and we are proud to fly the flag for Enterprise both through running the marathon and by providing our vehicles which help with the smooth running of the event,” Denker said.